Two years ago, the Government announced an expansion of university places to give 40 per cent of each school cohort a shot at university education right here at home by 2020. It translates to 16,000 places yearly and the additional spots will be provided mainly by the Singapore Institute of Technology and SIM University which will have a more applied, practice-oriented focus and produce a different type of graduate. Parents and students no doubt cheered the move, and the promise of a better future for young Singaporeans. 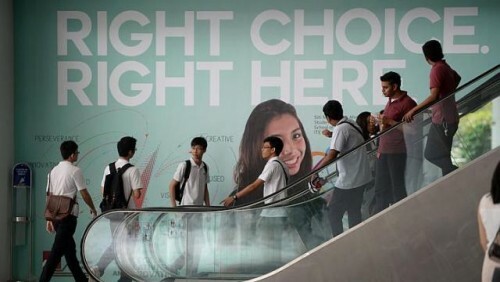 But now with the Applied Study in Polytechnics and ITE Review (Aspire) committee recommending pathways in which Institute of Technical Education and polytechnic students can work and further their qualifications, some parents and students are left confused. "Why this flip-flop?" asked businessman Terence Koh who has two sons studying engineering in the polytechnic. "I was very happy that the Government was providing more places for polytechnic students and a more applied pathway that is suited for poly students like my sons. But now it looks like they are saying a degree path is not for them. "They are better off going to work and furthering their qualifications through work," said the 46-year-old, after reading the recommendations. But as Education Minister Heng Swee Keat said yesterday, his ministry is not changing its stance. Neither is the Aspire panel trying to dissuade ITE and polytechnic graduates from pursuing degrees. Rather, it is pointing out that for some students at least, a diploma plus deep and relevant skills may pay off better in the long run. As Mr Heng stressed, it is about having the "right and relevant type of learning experiences that will enable an individual to build deep skills and expertise". Senior Minister of State for Education Indranee Rajah, who chaired the committee, stressed that the recommendations must be seen against a backdrop where there is growing demand worldwide for workers with deep skills. "The employers tell us this, OECD reports point this out and our study trips abroad confirm this," she said, adding that students and parents must also be mindful of the changing nature of jobs and how technology is disrupting jobs. She is right - the jobs that are in demand today may not exist tomorrow. These are important issues that students and parents must consider. No doubt, right now having a degree increases the prospects of landing a graduate-level job and, along with it, graduate salaries. Fresh graduates earn $3,000 a month on average. A 2007 Ministry of Manpower (MOM) study showed that every extra year of schooling increases a worker's earnings by 13.7 per cent. The rate is higher for tertiary education. MOM figures also indicate that currently the Singapore economy can support a large number of graduates. About half of Singapore residents aged 25 to 29 hold degrees and 44 per cent of those in this age group earn at least $3,000 a month. Still, what happened in the past may not accurately reflect what may happen in the future. The opening up of university places may lead to a glut of graduates, especially during times when the job market is unable to absorb them all. One only needs to look at the situation in South Korea and Taiwan where graduate unemployment is high and starting salaries for degree holders have fallen. In Taiwan, starting salaries for fresh university graduates are about $1,200 - less than half that for those here. Also, in a recession, graduates are more likely to be laid off. When the Singapore economy slowed a few years ago, diploma holders fared better. Official figures for the third quarter of 2009 showed that among those unemployed, about 6 per cent were diploma holders while 22 per cent were degree holders. And fewer polytechnic graduates were laid off than their university peers. Degree hopefuls should also note that not all degrees are created equal. Those opting for one that does not emphasise quality are likely to be disappointed when it doesn't land them the jobs they want. This is already the case for many private school graduates who complain of employers not recognising their qualifications or paying them less than graduates from reputed universities. As the Aspire committee has stressed, it is important that students, whether diploma holders or A-level school leavers, first figure out where their interests and talents lie. And not all talents are best nurtured by immediately heading for a diploma or degree. There are many who would benefit from going out to work for a few years to hone their skills and understand the demands of the career they are interested in. This way, when they further their qualifications, they are able to make the most of their education to meet their career aims.